Create a separate 12 x 18- inch foil pouch for each fillet. 1. Place a fillet on a sheet of aluminum foil that has been sprayed with olive oil. 2. Add a palmful of onion, bell pepper and tomato to the top of each fillet, trying to keep as much as possible on top of the fish. 3. Add a couple of shakes of cilantro, basil or dill and Italian blend seasoning and garlic salt to each. 4. If desired, add cut up or whole Kalamata olives and capers to taste. 5. Close and seal each pouch and place on a hot grill or in a 400 degree oven for 12 to 15 minutes. 6. Open pouch and test for doneness. 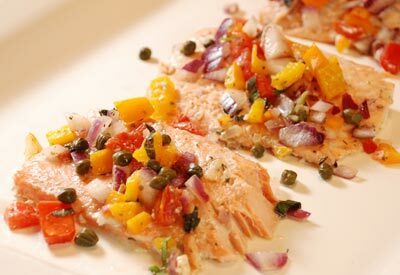 Salmon is done when meat flakes easily and is evenly colored. 7. Remove from foil pouch and plate.